You have to be one of the luckiest bunnies in the world. You not only live indoors, but have the run of the house. Smart enough to know so many tricks. Best of all, you are loved by your human family. My name is Farane and this is my bunny MnM. Some reasons that make him special is that he is a indoor bunny - no being stuck in a hutch outdoors for him! He runs around in our living room, and goes behind the couches and good thing is he dosn't chew on anything! Whenever I'm bored I go to MnM and we play together downstairs in the basement. He knows games like Tag, Hide and Seek, Soccer, ect;. MnM Is a lionhead, dwarf rabbit crossbreed. He loves to sniff and whenever he wants attention, he either nudges our feet or taps his foot. He also loves salad and carrots of course! And in the summer, we get him on a leash and walk him in our grden for exercise. He gets lots of love and is special to my whole family, and we love him lots and he loves us too! Hello, Farane and MnM! Happy Bunny Pet of the Day! What an adorable bunny you are, Mr. MnM! I like your fluffy white fur with the dark markings around your eyes, and a few on your body. I like your cute, petite ears too! I would be glad to give you some pats - since I can't, though, I hope Farane or another family member will give you some for me. You are a busy fellow - running in the living room, going behind the couches, and playing games! You nudge your people's feet or give a foot tap when you would like to get their attention. When the weather is fine, you go outdoors in the garden to check on all that's happening! Best of all, you are a greatly loved bunny ! Happy, happy Pet of the Day to dear MnM! Dearest MnM, what a beautiful bunny you are! You are so pretty, and you are full of personality, too. You live a special life as an indoor bunny, and you make your dear humans smile with all your energy and antics. You and they all love each other greatly, don't you. What a delightful love-filled home you share! 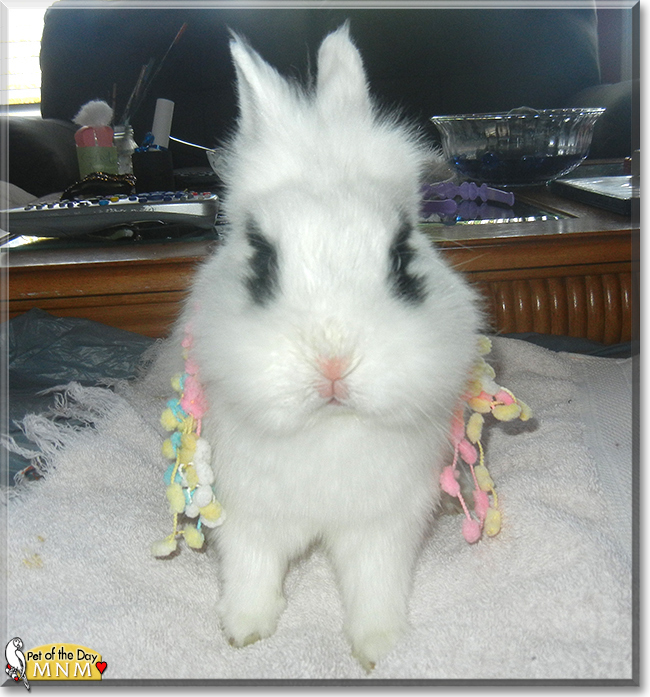 Congratulations, darling MnM, on being chosen today's Pet of the Day! We hope you and all your family and friends are enjoying a fine celebration, full of fun and lovies and all your favorite games and treats. Hi MnM! Happy Pet of the Day to you, sweetheart, and to your proud human Farane, too! What a beautiful, oh so precious Lionhead x Dwarf bun you are, sweetheart! Your photos are beyond heart-melting! I can only imagine how soft to the touch your fluffy coat is, what a pleasure it is to cuddle you! And how special is that smokey eyeliner! hehe Your family loves you so VERY much, MnM, and for good reason! You're not only beautiful on the outside, but just as sweet and loving as can be! And I have no doubt you love your humans every bit as much as they love you! You are one lucky girl, truly living the good life, treated to only the best, from deluxe accommodations to all the love your heart can hold! How blessed your family is, having a furkid, a best furry friend as special as you, MnM! You're a treasure!!! Thanks for the BIG smiles, cutie pie! Meeting you has been the perfect ending to my long, tiring day! I hope you're enjoying a very special Pet of the Day celebration...playing tag, hide and seek and soccer, hehe; munching on yummy veggies; cuddling with your humans; being loved and pampered to pieces! Tons of love, snuggles and kisses to you, precious MnM, our very special and most deserving Pet of the Day, EVERY day! So precious! That face! Those footies!!! No way there's a bunny as cute as MnM! We are so happy he is a happy, healthy housebunny. MnM needs to be spoiled and pampered and kept safe, at least I sure would if I was a rabbit! Happy POTD to the most darling bunny MnM!! Congratulations to Adorable MnM on being Pet of the Day!